Living at Landwick Cottages at the time (although I don’t know the exact year of this incident) we children were happily playing outside when a police car drew up and the police spoke to our mums (our dads were at work). Apparently they told our mums to stay indoors as a convict had escaped and was seen heading this way. 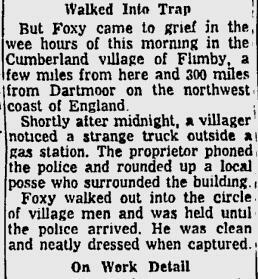 “Foxy Fowler” they called him. However our mums got us in as told, but as soon as the police car disappeared down Oxenham Farm Road we all went out, mums as well, and waited for the police car to come back. After a while we saw the police car and when it got nearer it stopped. We thought the police were going to tell us off. However they only wanted to tell us that they’d got their man, so we were safe. In the back of the car we saw this man handcuffed to a policeman. 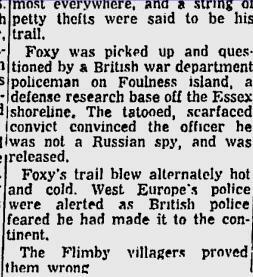 They had picked him up on Rushley Island. One of the neighbours asked the policeman if he would like a cup of tea, but he declined. We went back to the games we were playing but obviously this was the main talking point for many months to come. 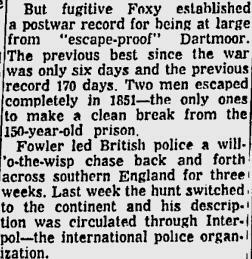 Foxy Fowler was a thief and prolific prison escapee having escaped from Dartmoor prison for robbery and possessing a gun.The news of Foxy Fowler’s capture spread far and wide as can be seen by this headline in The Spokesman Review a daily newspaper in Spokane, Washington and one of the largest circulation newspapers in the USA. An extraordinary situation, developing almost to a riot, has been occasioned during the weekend at Great Wakering, consequent; it is alleged, on the prohibition by the Chief Constable of the County, Capt Showers, of a presentation to Pc Baker, who had been stationed for a considerable time in the village. The constable was undoubtedly popular in the village, and a sum of 5 pounds was gathered for the purpose. Application was made to the Chief Constable for permission to give the present, and Friday night last was fixed provisionally for the public demonstration; a handsome marble clock having been purchased with the funds. However, before the gathering took place, Ps Totterdell walked over from Shoeburyness, and said the same was not to take place: official sanction being withheld. The villagers have shown a marked disapproval of the conduct, which they attribute to the influence of the local sergeant, Ps Mynott, an officer who has got a good record to show in the county. The discontent felt by the populace took shape during Saturday, and for some time previously the boys of the township had indulged in hooting and shouting after the Sergeant. Some of the leaders in the presentation on Saturday night took the matter up, but the affair quickly got beyond their control. The upper end of the town was particularly excited, and partisanship ran riot. An effigy was promptly made and enclosed in a policeman’s tunic and old helmet - where the material was so quickly found it is hard to say - and with this mounted on a pole, the noisy element tramped the village streets, shouting and hissing to their hearts content at the mention of the Sergeant’s name: only breaking at intervals to cheer for Pc Baker. There was other matters introduced by the demonstration, but with this it is not necessary to deal. It was unfortunate that the affair happened near to Guy Fawkes’ day, for the crowd soon seized upon this as a means to demonstrate their opinion on the matter that had held the village gossip. The effigy, having been paraded, was carried to the green at the upper end of town, and to the tune of discharging fireworks, hissing and booing, was set alight. Hundreds of people took part in the demonstration, and all the while Ps Mynott discharged his duty to the County he was followed on his patrol by the demonstration. The Shoeburyness police officers, under Ps Totterdell, and officers from Southend were drafted into the district, but the wildest scenes of disorder prevailed, and the sole cry was, "Shall we burn him? ", the reply being a skit "Why not". However Ps Mynott was prevailed to remain indoors for the rest of the evening, and the demonstrators soon began to separate. The disorder was continued slightly on Sunday, but on Monday there was a further demonstration. This was chiefly confined to the parade of the streets and the discharge of fireworks irrespective of the provision of the law. Some of the more enthusiastic arranged a big affair for Tuesday evening, Guy Fawkes day proper, but the more respectable class, when they found what was happening, forsook the demonstrators, and some cleared out of the village for the night. Supt Pryke had personally taken up the matter, and had extra constables on duty for the time being: Southend, Shoebury, and Little Wakering sending officers. The demonstration on Tuesday was tabooed by the police and the village soon knew it. A wagonette with six sturdy constables, under Supt Pryke, drove into the village and took "possession" for the evening: other constables going over by the 6.10 from Southend. For a while the crowd ruled the roost. They shouted "Shall we burn him?" and answered their own query with "Why not?" up and down the High Street, and the police looked on contentedly, smiling at their vain endeavour to awaken enthusiasm. The labouring element of the village assembled in the village inn and talked excitedly of the situation whilst they sipped their pint, and others gathered in groups at convenient corners, hoping for what never happened. The police were paired and given short patrols, and for a period they remained inactive. About 7.30 there was a move on the part of the police: a dozen names being promptly secured of young fellows seen to be discharging fireworks in the street, a d, immediately this was noised abroad, there was a noticeable lull in the hostilities. Dozens were seen to be making their way home and the remark was passed "I ain’t going to have a blue bit of paper if I can help it". At eight o’clock the general store where fireworks were being procured closed its door, and coupled with the police action, the High Street resumed a quiet state. Many dispersed to their homes, and only the youths of the district and those who had wandered over from Shoebury and Little Wakering and neighbourhood remained expectantly in the street. The police still paraded in couples, and Supt Pyke was making arrangements at 8.30 for the return of the Southend and other constables about 10 o’clock. The London Press had an excited account of the matter on Monday: recording that a dozen police effigies were burned on Monday evening, when as a matter of fact there was no effigy exhibited that day. The police of whom there was nearly a dozen on duty in uniform, with several officers in plainclothes, made themselves acquainted with the chief movers in the matter, and it is probable the demonstration will have an ending elsewhere, little thought of by those taking part in it. They made themselves fully aware of where the effigy for Tuesday’s programme was being housed, and kept a strict watch to see the same was not removed: in fact, they were assured, like the ’Southend Standard’ representative, that it would not appear for the demonstration that night. About 9.30 there was a renewal of the demonstration: this time the origin being at the bottom of the town. A number of labourers suddenly appeared on the scene bearing an orange box draped with black cretonne, and they were about to proceed up the High Street with their ’coffin’, when the news was carried to the police. They acted quickly and smartly, seized the emblem and smashed it, carrying away the pieces, whilst those in charge bolted away. The procession had come from one of the building estates at the lower end of town, and had apparently a separate foundation to the originally planned demonstration. There was some further shouting and excited conduct when the public houses closed, but the police soon stopped this, and an hour later they cleared the High Street. Soon after they were mustered and dismissed to their homes; the Southend contingent getting back as morn was approaching. There were many additional names taken at this later stage of the affair, and the business of the County Bench will probably be brisk at this later stage of the affair, and the business of the County Bench will probably be brisk at no distant date. POLICE DOG CAUGHT GAOL-BRAKER. 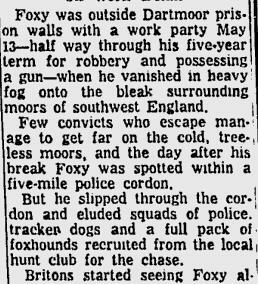 Master gaol-braker William John H “Foxy” Fowler, who had sworn vengeance on the Flimby men responsible for his recapture in June, 1957, 33 days after a Dartmoor break-out, escaped again last Wednesday from Parkhurst Prison. This time a police dog ended his stolen freedom in just three days and before he could cross from the Isle of Wight to the mainland.